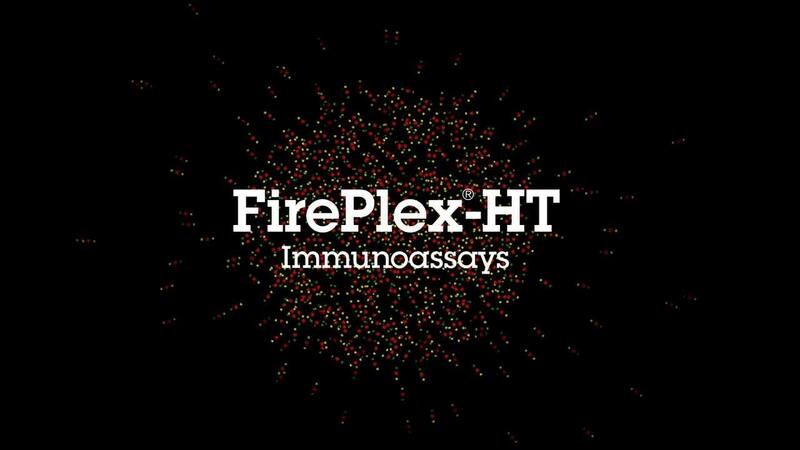 FirePlex®-HT immunoassays offer the high-standards of performance and multiplexing you expect from our original FirePlex immunoassays, now in a high-throughput, automation friendly format. Ideal for discovery, screening and profiling projects, Fire-Plex-HT offers you a fast, easy and cost-effective tool to analyze thousands of samples rapidly. Reach your R&D goals faster, and accelerate your path to success with FirePlex-HT immunoassays. FirePlex-HT uses our custom FirePlex particle technology and our highly validated antibody pairs to deliver rapid, flexible, and sensitive high-throughput multiplex screening without the need for proprietary or closed system instruments. Figure 1. To capture analytes onto FirePlex particles, biological samples are added to a 384-well imaging plate and incubated with the FirePlex-HT Reagent Mix overnight. Subsequently, an Imaging Dye is added, and plates are scanned on high-content imagers. The FirePlex Analysis Workbench software generates standard curves and quantifies analytes of interest directly from image files. assay performance or data quality. With FirePlex-HT there is no trade-off between quantity and quality. Achieve high-throughput without sacrificing assay performance or data quality. Table 1. Human analytes and corresponding sensitivities available with FirePlex-HT. Pre-designed 10-plex and 6-plex focus panels offer ready-to-go analysis of key human cytokine combination. Scan data quickly and easily on high content imagers, in less than 20 minutes per plate. FirePlex-HT assays are compatible with machines from various prominent manufacturers including Molecular Devices, TTP Labtech, Perkin Elmer, GE, and Yokagawa. To facilitate instrument set-up, we also offer a FirePlex-HT Imager Setup Kit (ab229130) . Figure 2. A–B: Fluorescent particle output. Three images, on in each channel (Ai–Aiii) are captured per well with approximately 20 particles analyzed per analyte using the FirePlex Analysis Workbench software. C–E: Eight-point standard curve analysis for CXCL1 (C), IFNγ (D), and IL-1β (E) scanned on Molecular Devices ImageXpress Micro, PerkinElmer Opera Phenix, TTP Labtech mirrorball, and Yokogawa Cell Voyager 7000 high-content imagers and analyzed with the FirePlex Analysis Workbench software. FirePlex-HT is ideally suited to high-throughput automated workflows. A: Example of an automated workflow for the FirePlex-HT Immunoassay. The Reaction Mix is dispensed into the Assay Plate using a ThermoFisher Multidrop Combi (Step 1), followed by transfer of biological samples (Step 2) and Assay Diluent (Step 3) into the Assay Plate using a liquid handler with a 384 channel pipette head. Samples are incubated overnight at room temperature, followed by addition of the Imaging Dye into the Assay Plate using a Multidrop Combi (Step 4) and image acquisition with a high-content imager (Step 5). B: Representative dataset from a FirePlex-HT immunoassay experiment run with an automated workflow. Data are interpolated concentrations of CXCL1 in untreated and treated cell culture supernatants. Readout of FirePlex-HT Immunoassays is compatible with various instrumentation platforms, including those manufactured by Molecular Devices, TTP Labtech, Perkin Elmer, GE, and Yokagawa. We offer a FirePlex-HT Imager Setup Kit (ab229130) desgined to identify properly resolving high-conetnt imaging instruments, which can be validated for use with FirePlex-HT immunoassays. Send us your samples for profiling and let us do the work. Our team of FirePlex® experts offers full support, from generating hypotheses to delivering results. With experience accumulated over testing 10,000 customer samples, you can confidently entrust your research to our skilled scientists. Results, along with publication-ready charts, tables and raw data files, are typically delivered within approximately 15 business days.